HMMA Team Member: Shon Hunter | Hyundai Motor Manufacturing Alabama,LLC. Stamping shop Team Member Shon Hunter has been at HMMA for the last 10 years. When she joined the Hyundai family back in October 2005, she began as an inspector. About four years ago, Shon moved out of the job of inspector and began working as a press operator. She says she’s had many new learning opportunities since taking on her new role. 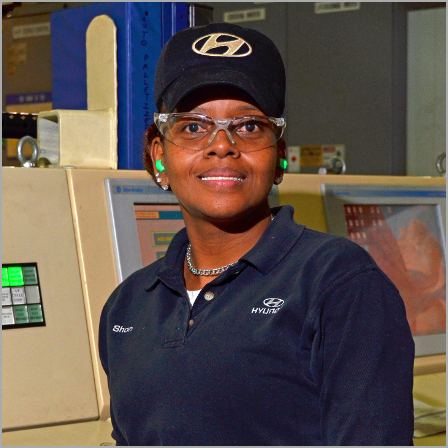 But Shon says opportunities like these are what makes Hyundai a place she loves to work.